Dublin is unique in having breeding seals within the city limits but apparently some members of the public use their presence to exercise their dogs by harassing these defenceless seals and pups. Here is a short Youtube video of Bull island tip, recorded at Sutton Cross on Sept 2nd 2017. A small dog on lead and its owner drove most of seal colony into water. Bull Island is a UNESCO biosphere with the highest level of international protection. This dog owner’s behaviour is both illegal and disgraceful. This untethered large dog chased seals from tip of UNESCO biosphere Bull island in full sight of owner, who threw sticks into water after seals were chased into water by the dog. 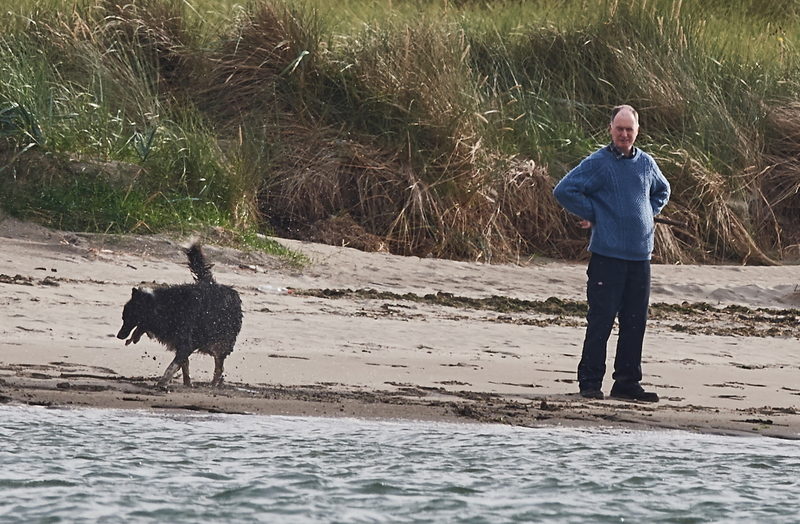 Dog and owner were observed harassing the seals for 90 minutes. Such behaviour is criminal and completely irresponsible. Grey Seals are breeding in the autumn and are very vulnerable to disturbance. They require their shore space and breeding beaches to give birth, nurse ashore for about 3 weeks and couple safely with ever watchful bulls. The GOLDEN RULE…..is give them space and observe from a distance. At this point of their life cycle they are utterly dependent on land. Walkers and dog walkers should avoid disturbance and allow these colonies to survive close to human habitations. It only takes a few disturbances, however inadvertent to drive them away from an area. Bull Island, where the above photos were taken is a especially sensitive area….unique also as host to both species of Irish seals, hauling out, feeding and breeding within the boundaries of the Ireland’s capital city. The Island a UNECO Biosphere of long standing, now extended to boundaries of Dublin Bay. With that designation, Protection is a requirement and over recent years both the nesting terns and hare have abandoned the island due to disturbance and if the seals are not to follow, dogs and walkers will have to be controlled, excluded from the island and accommodated elsewhere in view of ISS. Two newborn, whitecoat, pups from island have died in last month and brought to UCD Vet College for postmortem by ISS, rangers and NPWS. One pup showed marks of predation. Dublin City Council in response to these records is discussing improved signage, zonation, voluntary island guides etc., but in meantime the seals remain vulnerable, the rangers and island under resourced and there is no excuse for waiting until it is too late. A pup born today or for duration of this season is at risk as is the whole colony in the longer term. The Bull Island is a stark but not unique case. The Bailey and Doldrum Bay outside Howth abandoned almost 100 years is still host to occasional pup and walkers have been observed climbing down to a pup in recent incident to take selfies and another misguidedly throwing pup into water. faithful to their breeding beaches and colonise new ones…..it is a lesson and effort of constantly re-enforcing the message and allowing space for wildlife. The common seals, which bred earlier are less vulnerable to threats from land as pups take to water on tide.. Recreational users should be aware of their presence as pups get separated from mothers by power boats, jet skis, etc. What to do if you see seals being harassed? If you can, photograph the culprit in action. In any event call the Guardai, National Parks and Wildlife Service and Dublin County Council and register the facts with them and make a formal complaint.